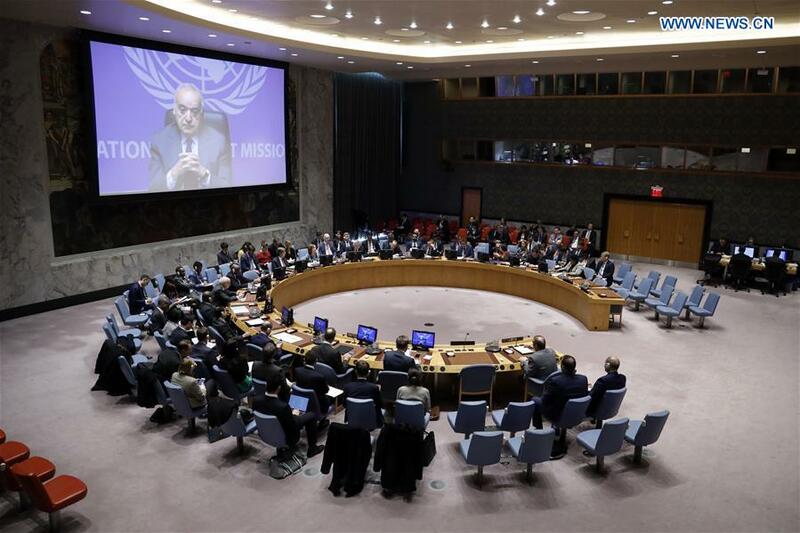 UNITED NATIONS, March 20 (Xinhua) -- The top UN envoy in Libya Ghassan Salame said on Wednesday that the situation in Libya has reached a crucial juncture. "We are working to prevent recent developments and tensions on the ground from escalating, and instead to pivot to stability and a political compact which will enable an end to the crisis in the country," Salame, UN Secretary-General's special representative for Libya, told the Security Council. Whilst there were some minor incidents, the peaceful arrival of General Khalifa Haftar's forces at Sabha, an oasis city in southwestern Libya, on Jan. 13, "was generally perceived as a positive and stabilizing development," he said. Salame said that the Libya National Army has brought a large measure of security and stability to the South which enabled the parallel bank in the east to deliver bank notes to Sabha, but it is unclear how long the campaign can be sustained given the long resupply lines and the limited financial resources of the parallel government. Salame, who is also the head of the UN Support Mission in Libya (UNSMIL), said that the mission has supported two rounds of preparatory talks between the advisors of Prime Minister Fayez Serraj and General Haftar. As a result of those talks, the two leaders met in Abu Dhabi and agreed to a number of principles: Libya shall be a civilian and democratically governed state that enjoys full civilian control of the military, and a peaceful transition of power, he said. The two parties also agreed on the need to unify Libya's long-divided institutions and for the scheduling of national elections before the end of the year, said Salame. Following the 2011 uprising that toppled former leader Muammar Gaddafi's regime, Libya has been suffering from escalating violence and political division. Serraj heads Libya's internationally-recognized government in the capital Tripoli while Haftar leads the army, which is allied with the eastern-based government, as Libya is politically divided between two governments in the east and the west, both competing for legitimacy. Salame also said the situation of the economy now in Libya is mixed. The re-opening of the Sharara oil field resulted in increased oil production that is returning to 1.2 million barrels per day. The foreign currency exchange fee, in combination with the liberalization of the opportunity to purchase foreign currency, continues to generate revenue, and strengthen the Dinar, the currency of Libya, he said. "This has increased purchasing power and reduced inflation and theprofitability of the black market for currency," he added. While important, these benefits may be short-lived without genuine economic reforms. Such reforms require a direct devaluation of the currency and the lifting of subsidies which consume nearly 10 percent of the national budget, Salame said. "Working with the two branches of the central bank of Libya, the national audit review process will soon begin." However, Libya s infrastructure continues to deteriorate at analarming rate overall, said Salame, adding that basic services including in health, water andelectricity, are eroding. Particularly the situation of water production is fragile. Salame called on the international community to put the interests of the Libyan people first, and to act committedly and sincerely to pressure all parties to avoid conflict and conclude a peaceful formula to end the transitional period in Libya.